Continuum is an 87”x78” quilt-as-you-go designed by Leonie West, the genius behind the Westalee brand of quilting templates. The quilt contains 13 different blocks using the templates included in the Continuum Class in a Bag. 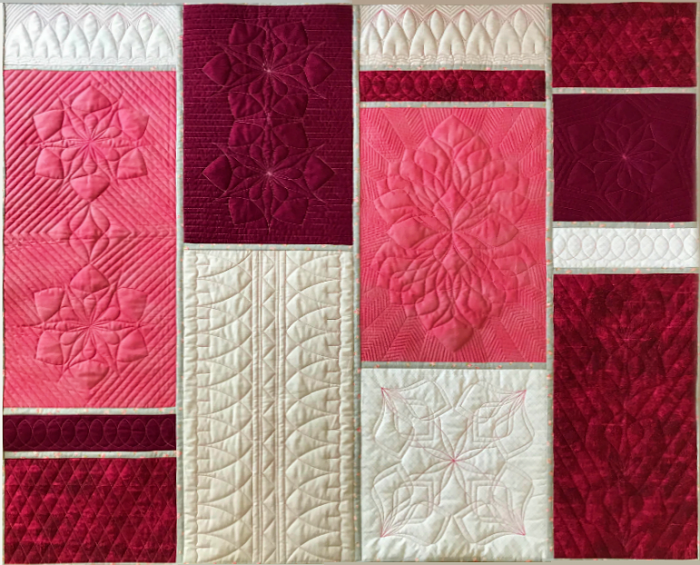 In this two day workshop, you will stitch each of the blocks once (and Block A twice) to make a 49”x42” quilt as pictured above. Because we are stitching so many blocks and time is of the essence, the blocks (fabric and batting) must be cut ahead of time and brought to class. Be sure to read through the cutting instructions to allow time for this before you come to class; it took me about 2-1/2 hours to cut everything. Click HERE to download the supplies list / cutting instructions.